"Amazon Fire" redirects here. For the smartphone, see Fire Phone. For the media player, see Amazon Fire TV. 7 inch multi-touch Gorilla Glass display, 1024×600 at 169 ppi, 16 million colors. Capacitive touch sensitive. The Fire, formerly called the Kindle Fire, is a tablet computer developed by Amazon.com. Built with Quanta Computer, the Kindle Fire was first released in November 2011, featuring a color 7-inch multi-touch display with IPS technology and running a custom version of Google's Android operating system called Fire OS. The Kindle Fire HD followed in September 2012, and the Kindle Fire HDX in September 2013. In September 2014, when the fourth generation was introduced, the name "Kindle" was dropped. In September 2015, the fifth generation Fire 7 was released, followed by the sixth generation Fire HD 8, in September 2016. The seventh generation Fire 7 was released in June 2017. On September 7, 2012, upgrades to the device were announced with consumer availability to those European countries with a localized version of Amazon's website (United Kingdom, France, Germany, Italy and Spain). As of October 2012[update], the Kindle Fire was the second best selling tablet after Apple's iPad, with about 7 million units sold according to estimates by Forrester Research and as of 2013[update] Amazon's tablets were the fourth best selling. On September 6, 2012, the Kindle Fire was upgraded to the second generation, and its price was reduced to US$159, RAM upgraded to 1 GB and processor clock speed upgraded to 1.2 GHz. A more powerful and video-friendly version, the Kindle Fire HD (7 and 8.9 inch versions) was also made available, initially priced at $199 and $299. On September 25, 2013, the Kindle Fire HD was upgraded as the third generation Fire, priced at US$139, and the Kindle Fire HDX was introduced. The Kindle Fire HDX had an improved graphics engine, double the memory, and triple the processor speed of the previous model. The 7-inch and 8.99-inch versions were introduced at US$229 and US$379 respectively. In September 2014, the Fire HDX 8.9 and the Fire HD were upgraded to the fourth generation of Fire tablets, removing the "Kindle" adjective in the naming scheme. There was also the Fire HD 6 that has a six-inch screen with a quad-core processor priced at US$99. In September 2015, Amazon announced the release of the Fire 7, priced at US$49.99 for the 8GB version that displays advertisements on the lock screen. As of March 2016[update] it was the lowest-priced Amazon tablet. In June 2016, its price was dropped briefly to US$39.99. This fifth generation tablet includes for the first time a micro SD card slot for extra storage. In September 2016, Amazon announced the release of the Fire HD 8 which includes the virtual assistant Alexa, priced at US$89.99. Fortune reported that, "As with most of Amazon’s devices, the aim isn’t to make money off of the hardware but instead to sell digital content such as books, movies, and TV shows to users". A slightly improved Fire 7 was released in June 2017, keeping the US$49.99 price point. The first-generation Kindle Fire has a sensor on the upper left-hand corner of the screen. This was widely considered to be an ambient-light sensor, disabled since an early software upgrade. Color display technologies consume much more power than monochrome electronic paper (E-ink) types; Fire offer a typical battery life of 8 hours of mixed usage, while monochrome Kindles offer 15 to 30 hours' use without WiFi—"battery lasts weeks on a single charge"—with a much lower-capacity battery. The first generation of Kindle Fire devices run a customized Android 2.3.3 Gingerbread OS. The second-generation Kindle Fire HD runs a customized Android 4.0.3 Ice Cream Sandwich OS. Along with access to Amazon Appstore, the Fire includes a cloud-accelerated "split browser", Amazon Silk, using Amazon EC2 for off-device cloud computation; including webpage layout and rendering, and Google's SPDY protocol for faster webpage content transmission. The user's Amazon digital content is given free storage in Amazon Cloud's web-storage platform, 5 GB music storage in Amazon Cloud Drive, and a built-in email application allows webmail (Gmail, Yahoo!, Hotmail, AOL Mail, etc.) to be merged into one inbox. The subscription-based Amazon Prime, which includes unlimited streaming of movies and TV shows, is available with a free 30-day trial period. 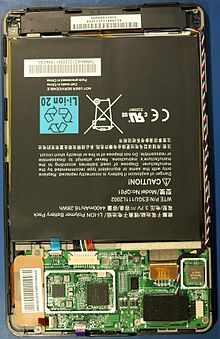 It is possible to convert a Kindle Fire to a tablet running standard Android, with some loss of Amazon-related functionality, and lacking features such as Bluetooth, microphone, camera, and memory expansion. Analysts had projected the device to be a strong competitor to Apple's iPad, and that other Android device makers would suffer lost sales. Customers began receiving Kindle Fires on November 15, 2011, and in December 2012, customers had purchased over a million Kindle devices per week. International Data Corporation (IDC) estimated that the Kindle Fire sold about 4.7 million units during the fourth quarter of 2011. 304 MHz 384 MHz 600 MHz ? There have been eight generations of Fire tablets, spread across three different models: Fire, Fire HD and Fire HDX. There have also been different-sized tablets within the Fire HD and Fire HDX models. Items in bold are currently available. Fire HD, the 'mid-market' version of the Kindle Fire, with improved specifications, including higher resolution screens and improved processors. Fire HDX, the 'high-end' version of the Kindle Fire, the mostly highly specified Fire, with improved resolution and faster processors. ^ Lai, Marcus (27 September 2011). "Amazon to burn new tablet this week, says report". Punch Jump. Punch Jump LL C. Retrieved 29 September 2011. ^ a b c Brian X. Chen (2012-10-19). "How Are 7-Inch Tablets Doing?". The New York Times. Retrieved 2012-10-20. ^ "Kindle Fire Device and Feature Specifications". Amazon Mobile app distribution. Amazon. Retrieved 16 February 2013. ^ a b Lee, Tyler (28 September 2011). "Amazon Kindle Fire unveiled". Ubergizmo. Blogzilla LLC. ^ Shahbaaz (September 28, 2011). "Amazon Unveils Kindle Fire Android Tablet ($199) & Kindle Touch ($99), Kindle 2011 Priced at $79!". tnerd.com. Archived from the original on October 10, 2011. ^ a b c d e f g "Kindle Fire - the Amazon Tablet with Full Color 7" Multi-Touch Display, Wi-Fi". Amazon.com. Retrieved 2011-10-02. ^ Grabham, Dan (October 31, 2011). "Amazon Kindle Fire: what you need to know Updated: Kindle tablet release date, specs, features and more". TechRadar UK. Future Publishing Ltd.
^ "Kindle Fire Comes to the UK—Introducing the All-New Kindle Fire HD and Kindle Fire". Press releases. Amazon.co.uk. 6 September 2012. Retrieved 10 September 2012. ^ "Amazon's Kindle Fire to go on sale in Europe (AFP)". Phys.org. 6 September 2012. Retrieved 14 September 2012. ^ a b "Amazon's Kindle Fire to sell at $199, challenging iPad". Chicago Tribune. 28 September 2011. Archived from the original on 26 October 2011. ^ Merritt, Rick (28 September 2011). "Kindle Fire profitable at estimated $150 BoM". eetimes.com. eetimes. ^ Olivarez-Giles, Nathan (18 November 2011). "Amazons 199 Kindle Fire costs 201.70 to build, report says". Los Angeles Times. ^ Myslewski, Rik (30 September 2011). "Amazon's Kindle Fire is sold at a loss". theregister.co.uk. The Register. ^ Whitney, Lance (29 September 2011). "Amazon to lose $50 on each Kindle Fire, says analyst". news.cnet.com. CNET. ^ Naughton, John (2 October 2011). "Kindle Fire: the tablet that knows your next move". The Guardian / The Observer. ^ Martin, James. "Amazon Kindle Fire". CNET. Retrieved 7 September 2012. ^ Franklin, Eric. "Amazon Kindle Fire HDX 7 - Tablets - CNET Reviews". Reviews.cnet.com. Retrieved 2013-09-25. ^ Wilson Rothman (2012-05-18). "Amazon's Kindle Fire HDX tablets pose real threat to iPad dominance". NBC News.com. Retrieved 2013-09-25. ^ "What's new with Amazon's Fire OS 4.0 "Sangria"?". AndroidGuys. ^ "Amazon Fire tablets". Amazon. Retrieved 4 March 2016. List of current Fire tablets on Amazon, sorted by price. ^ "You can actually get a brand new Amazon Fire tablet right now for $40". bgr.com. Retrieved 26 September 2016. ^ "Fire Tablets MicroSD Card How To Guide – Everything You Need to Know". ebook reader. Retrieved 26 September 2016. ^ "Amazon's new Fire HD 8 is its first tablet with Alexa". engadget.com. Retrieved 26 September 2016. ^ "Amazon Debuts Its First Fire Tablet With Virtual Assistant Alexa". fortune.com. Retrieved 26 September 2016. ^ "Amazon Fire 7 (2017)". PCMag UK. 2017-07-05. Retrieved 2017-09-12. ^ "The Amazon tablet will look like a PlayBook - because it basically is". Engadget. Retrieved 2014-06-19. ^ Murph, Darren (28 September 2011). "Amazon Kindle Fire tablet unveiled: Android-based, 7-inch display, $199 price tag". Engadget. AOL Inc.
^ Ziegler, Chris (28 September 2011). "Amazon Kindle Fire vs. iPad 2 vs. Nook Color: by the numbers". This Is My Next. Archived from the original on 30 September 2011. ^ "Kindle Fire - Full Color 7" Multi-Touch Display with Wi-Fi". Amazon.com. Retrieved 2013-03-18. ^ "Fire HD 6 - Amazon site". Amazon.com. Retrieved 7 March 2016. See "Compare Fire Tablets" section: New HD6, HD8, and HD10 all claim "Up to 8 hours of reading, surfing the web, watching video, and listening to music"; 7" Fire claims 7 hours. Google search <site:www.amazon.com "compare fire tablets"> for latest information. ^ Dawson, Christopher (17 November 2011). "Kindle Fire: Edu holy grail or one more DRM-ridden toy?". ZDNet. Retrieved 2013-03-18. ^ "Eric Bergman-Terrell's Blog". Ericbt.com. Retrieved 2013-03-18. ^ "Kindle e-reader – Amazon's Official Site – Learn More". Amazon.com. Retrieved 7 March 2016. ^ Hollister, Sean (28 September 2011). "Amazon's Kindle Fire UI: it's Android, but not quite". This Is My Next. Archived from the original on 31 October 2011. ^ "Getting Started with Kindle Fire". ^ Tung, Liam (2011-09-20). "Amazon opens global Appstore by stealth". Itnews.com.au. Retrieved 2013-03-18. ^ Boulton, Clint (29 September 2011). "Amazon EC2 Underlies Kindle Tablet 'Silk' Browser". www.eweekeurope.co.uk. Archived from the original on 5 October 2011. ^ "Introducing Amazon Silk". amazon.com. Amazon.com. Retrieved 2011-10-02. ^ 'Amazon Silk team' (28 September 2011). "Introducing Amazon Silk". amazonsilk.wordpress.com. Archived from the original on 5 July 2012. ^ Ku, Andrew (November 24, 2011). "Storage Performance: Slightly Faster Than USB 1.0?! : The Amazon Kindle Fire: Benchmarked, Tested, And Reviewed". Tom's Hardware: Hardware News, Tests and Reviews. Retrieved 2011-12-04. ^ Rick Broida (21 June 2013). "Turn your Kindle Fire into an Android 4.2 tablet". Cnet.com. Retrieved 7 March 2016. ^ Letzing, John (September 28, 2011). "Amazon to Challenge iPad". The Wall Street Journal. Dow Jones & Company, Inc. Retrieved 2011-10-01. ^ "Amazon's Kindle Fire Will 'Vaporize' Android But Leave Apple Unscathed". TheWrap.com. Retrieved 2013-03-18. ^ Lee Brodie, ed. (28 September 2011). Gene Munster: Samsung, Others Should Worry about Kindle Fire. cnbc.com. CNBC. ^ "Kindle Fire Review". Project Gutenberg. 21 December 2012. Retrieved 2013-03-17. You can get free ebooks to the Fire too, but the process is so cumbersome that it isn't worth the trouble given the alternative of buying a Nexus 7, which handles free ebooks with ease. To be specific, there is no way to download free books from the web and have the Kindle Fire store them permanently or in the same places where your books from Amazon are kept. This was easy with the Kindle 3. No more. ^ "Amazon Appstore Presentation at CES". Amazon Appstore Developer Blog. January 6, 2012. Retrieved 7 January 2012. ^ Thomas Claburn (2012-04-07). "iPad Mini: 6 Reasons Apple Must Do It". InformationWeek. Retrieved 2012-04-13. ^ Nakashima, Ryan. "Kindle Fire helps Amazon beat 1Q estimates". Yahoo News -Tech. Retrieved 28 April 2012. ^ a b "Tablet Device Specifications Fire Tablets". developer.amazon.com. Retrieved 2018-10-29. ^ Amazon's Kindle Fire HD: Better; Can It Compete With The Nexus 7? ^ "Macro photo of the Amazon Fire 2015 motherboard". forum.xda-developers.com. Retrieved 2015-12-23. Wikimedia Commons has media related to Amazon Kindle Fire. This page was last edited on 17 April 2019, at 12:37 (UTC).